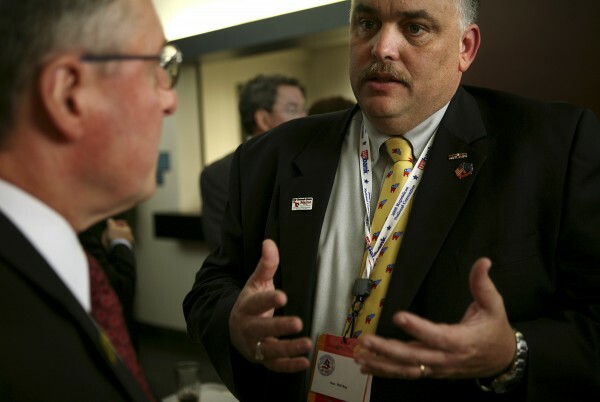 Maine Congressional District 2 Delegate Phil Roy of Fairfield argues the merit of GOP vice presidential pick Sarah Palin to Tom Kosel of Minneapolis, Minn., in September 2008. It has been about three weeks since newspapers have run a story about the Hancock County chief financial officer, Philip Roy, mishandling public funds three years ago and again last year. Not much has happened since that sensational report, probably because there are two or three sides to the story. No one disputes the facts disclosed in the 2,000-word article by the Maine Center for Public Interest Reporting, based on a long investigation and requests made under the Freedom of Information Act in August 2009. Roy “borrowed” about $15,000, first from the Maine Republican Party and the next day from the Central/Western Maine Workforce Board, a federally authorized nonprofit body. He was treasurer of both organizations. He used the money to buy a camper, although the board understood Roy would use the funds for his residence. When an auditor discovered the transaction, Roy returned the money on Dec. 14, 2009, plus $226 in interest the following month. Because federal funds were involved, the Federal Bureau of Investigation looked into the matter. Steven Joy, chairman of the Hancock County Commissioners, said recently that he understood the FBI had completed its investigation but had not closed the case. In Roy’s other questionable action, he directed elected county treasurer Janice Eldridge in February and March 2011 to transfer $750,000 from the Hancock County-Bar Harbor Airport’s general fund to the county’s general fund. The general fund had run low at the time. Roy said the transfer was to take advantage of a high-yielding investment opportunity. The airport manager, M. Allison Rogers, said it was to cover county costs. When the county treasurer told Rogers about the transfer, she complained to the commissioners. The money was returned several months later, with $2,400 interest that it had earned. County Commissioner Joy disagrees. He said he checked with the FAA and was told the transfer was in a “gray area,” and that the only problem was that the commissioners had not done the necessary paperwork. He said that the transfer helped the airport fund earn interest income and could be done from time to time in the future. Joy blamed Treasurer Eldridge for signing the transfers without authority of the commission. Behind the scenes, there is considerable ill feeling between Roy and Eldridge and Sheriff William Clark, involving some procedural changes made by Roy with the approval of the commissioners. Friction arose over Roy’s insistence that county officials use special credit cards rather than their VISA cards to pay for tax-free gasoline for official use. Joy said there was some objection to Roy’s installation of an electronic entry system to show what time each person comes to work. Joy insisted that Roy is doing an excellent job in managing county finances and that new procedures make certain that all financial transactions now will be approved by commissioners. The likely and probably best outcome of this affair is to regard Roy’s use of public funds to buy a camper a serious offense but a closed case. Now it’s up to the commissioners and their new surveillance system to prevent any such mischief in the future. The commissioners’ future investment of airport funds, even though helpful in earning interest for the county, remains an open question until the FAA comes out with a decision. Correction: An early version of this story incorrectly said Philip Roy “borrowed” from the Hancock County GOP. It was from the Maine Republican Party.